School leavers interested in learning a trade but dissuaded by society’s bias toward university are encouraged to genuinely compare the two options. When it comes to employability, cost and earning potential, a trade option often can come out on top. NECA Electrical Apprenticeships general manager Tom Emeleus says more school leavers are going to university based on a myth that it is the only way to secure a strong future but fewer jobs require a degree than many people think. “We’re setting up a generation of youth with unrealistic job expectations and large debt,” he says. “In NSW there are 10 qualified school teachers seeking employment for every available job. This is just one of numerous examples. Of 2014’s apprentice and trainee graduates, 84.1 per cent were employed after completion, the National Centre for Vocational Education Research finds. Of university graduates from the same year, by comparison, 68.8 per cent of those looking for full-time work found it within four months, Graduate Careers Australia data shows. Emeleus says electrical apprentices in particular have high employment rates and 99 per cent of NECA apprentices are immediately hired. Electrician Ben Proudfoot does not regret his choice to pursue a trade over university as he was hired straight out of his apprenticeship by host employer Stowe Australia. Proudfoot, an NECA graduate, says his parents never pressured him to go to university but some of his friends that chose that path did not understand the appeals of an apprenticeship – although now they do. “Some of them are happy with what they are doing but some go ‘oh I wish I had a trade’ when they see what I can do,” he says. University fees differ depending on degree and institution but range from $6000 to $10,000 a year. An apprenticeship, on the other hand, is paid for by the employer so the apprentice can graduate without debt. They also earn while they learn unlike with a university degree, during which students must rely on parents or work part time on top of study. A first-year apprentice bricklayer employed on award rates, for example, usually earns $12.78 an hour, increasing to $20.07 an hour as a fourth-year apprentice. In electrical trades, Emeleus says an apprentice will typically earn $150,000 over the course of their training. Toby Clare dropped out of a business degree at university to become a carpenter and plumber. Picture: Bob Barker. The median annual starting salary for a new bachelor degree graduate younger than 25 and in their first full-time job was $54,000 in 2015, Graduate Careers Australia reveals. By comparison, NCVER finds the median annual income of a VET graduate working full time is $56,000. For those employed before finishing training, the median was even higher at $59,000. Emeleus says new electricians on award rates start on $56,000 but many in the construction industry can earn as much as $80,000 to $91,000 a year straight out of their apprenticeship. TAFE NSW Illawarra Institute director Di Murray says people are surprised how far a trade, and vocational education, can take them. “You only have to think about how much you might pay a plumber to come in and do some work for you – trade qualifications can pay very well,’’ she says. 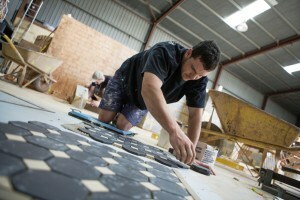 It is the ability to use a trade qualification to start your own business that is key to a higher income. As is gaining qualifications in an area experiencing skills shortages. Toby Clare, 29, dropped out of a business degree at university and instead studied plumbing and carpentry. Now a licensed plumber and builder, Clare says he is so busy he is turning work away. “I was fairly confident I could earn just as much money doing a trade as I could have if I’d stayed at uni (and gone into a career in business),’’ he says. Ultimately, any career has the potential to be highly profitable though, according to university professor Maurice Pagnucco. Pagnucco is head of computer science and engineering at the University of NSW, which topped the list of Australian universities with the most millionaire graduates. “It would be misleading to say that if you want to become a millionaire you have to do this particular course,’’ he says.